These practices are designed to retain stormwater runoff and allow the water and pollutants to percolate into the soils and/or be taken up by plant activity within the project. 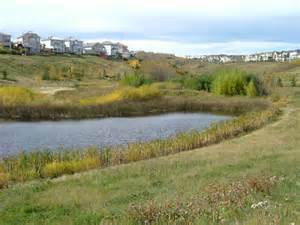 Located down grade from an impervious surface like a driveway, parking lot or home or business location. Bioretention facilities must include location of buried utilities and other infrastructure. Very popular as it is relatively small and widely implemented on residential locations as well as public spaces such as a school, library or government office. These are typically used as demonstration projects. Bioretention Facility, Moderate. Rain Garden, Easy. The Chesapeake Bay Trust funds large and small projects through several grant programs. High demonstration potential improves likelihood of funding success. The Maryland Department of the Environment and the U.S. Environmental Protection Agency 319 Grants, and the Maryland Department of Natural Resources are also sources. The best time to observe the operation of rain gardens and bioretention facilities is during and immediately following rain events. Check the water flow to ensure proper infiltration and storage. If stormwater is causing erosion or is standing for more than 48 hours after the end of a rain event, the facility may need to be renovated. Facilities receiving a lot of sediment may require extra attention to ensure water infiltration. Replace mulch and remove any dead plant material annually. There are an increasing number of local businesses and landscaping contractors who are well trained in this BMP’s maintenance requirements. Develop a framework for applying modular implementation (this consists of project phasing over time as climate adjustments occur). Establish standards for evaluating risks of overflows during extreme events. Implement multiple facility types to diversify stormwater management processes. Be sure to locate underground utilities prior to construction. Planning cannot be overstated for the larger facilities as engineers should be retained to perform stormwater treatment ability and sheet flow calculations. Description: The project is in an established residential area in the Town of Easton near Papermill Pond, a tributary of the Tred Avon River. The contributory drainage area is .85 acres of lawn and .66 acres of impervious cover. A .33-acre bioretention system was designed and constructed to treat surface water runoff. Description: 312 square feet of bioretention installed in a parking lot island. Description: several downspouts were diverted from the parking lots and building perimeter and sent to multiple rain gardens for treatment. Description: This practice was combined with a downspout disconnect that then lead to a rain garden down gradient. Porous paver patio, conservation plantings and rain garden were all installed in a high visibility location that serves as a great demonstration BMP train. Volunteers (4-H youth group) planted the rain garden.